Governor Akinwunmi Ambode of Lagos State on Sunday said true federalism was the only way to drive democracy in the country. Mr. Ambode, represented by the Secretary to the State Government, Tunji Bello, made the assertion at the 23rd anniversary of the annulment of June 12, 1993 Presidential Elections. 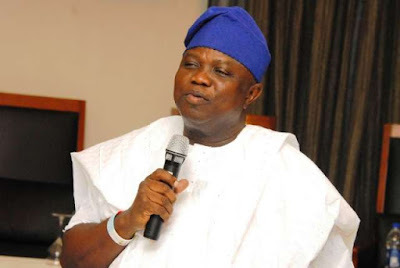 Governor Akinwunmi Ambode of Lagos State on Sunday said true federalism was the only way to drive democracy in the country. Mr. Ambode, represented by the Secretary to the State Government, Tunji Bello, made the assertion at the 23rd anniversary of the annulment of June 12, 1993 Presidential Elections. “We still have a long way to go in our country today and that is because we are not practicing true federalism. And for us to achieve that, we need to work really hard. “We must ensure that we install a viable federalism in Nigeria, that is the only way to build and enjoy our democracy as well as honour the memory of late MKO Abiola,” he said. Mr. Ambode said that his administration would strive to uphold the ideals of June 12 by ensuring the expansion of the frontiers of democratic governance and social justice. Also speaking, Ndubuisi Kanu, a former Military Governor of Lagos State, said that the practice of true federalism was the solution to the challenges facing the country. “Whatever is happening now in the country either militancy, IPOB or others will not stop until we go back to the Nigeria that we are expected to build; a federal Nigeria. “We should brace up and be prepared. Prayers alone will not solve the problem. We have to get back to a federal Nigeria,” Mr. Kanu, retired Rear Admiral, said. In his contribution, Ayo Opadokun, Convener of the Coalition of Democrats for Electoral Reforms, said that restructuring was the solution to country’s challenges. “After 23 years, those who denied Nigerians the opportunity of true democracy are still living and are in government positions. “But it is sad to note that they have not done anything to correct the mistakes from the lessons of June 12. “June 12 will continue to be relevant until Nigerians are given the opportunity to decide their fate in the country and that is when Democracy would have been enthroned,’’ he said. Mr. Opadokun urged President Muhammadu Buhari to direct the Independent Electoral Commission to announce Abiola as the winner of June 12, 1993 election as well include his name in the names of past presidents of Nigeria. In his lecture, Olumuyiwa Noah, a lecturer at the University of Lagos, urged elders in the country to narrate the story of June 12 to the younger generation to curb electoral malpractices. “We owe it a duty to tell the story of June 12 to our young ones who are ignorant of what transpired so that they are aware; and in future, elections malpractices will be curbed,” the professor said. In his remarks, Kehinde Joseph, Special Adviser to Governor Ambode on Civic Engagement, said that the anniversary was to keep the essence and lessons of democratic experience alive. The June 12, 1993 presidential election was annulled by former military dictator, Ibrahim Babangida, before the final announcements of results. Initial results released showed that Moshood Abiola, a billionaire philanthropist, had an unassailable lead over his then opponent, Bashir Tofa. Mr. Abiola, who later died in government custody, is believed by most Nigerians to have won the election, considered one of the freest and fairest in Nigeria.